From football games to pumpkin patches, autumn in Ohio is a special time. While everyone has different fall favorites, it’s probably a safe bet to say that no one’s favorite is fall yard work. However, it’s a vital part of maintaining the function and appearance of your home and lawn. If you are struggling to put together your to-do list, we would like to provide you with some simple reminders. If you find yourself in need of lawn care, pest control, or some other lawn service, be sure to contact Lawn Control Center. We proudly service the greater Columbus and Cleveland area. Learn more about us, our service area, services, and contact us today for your free quote. Fallen leaves and weeds are a big problem in the fall. Not only can this debris clog up gutters, but it also provides the perfect place for pests to settle in for the long winter. Before winter arrives, be sure to clear out flower beds of all weeds and leaves. Additionally, clean out your gutters and ensure that all of your drains are free of blockages. If you planted a garden this summer, the fall is the perfect time to pull out old plants, remove debris, and completely till the plot. For those who compost, this is also a great time to add a nice layer of compost. This will provide your plot with some much-need nutrients, helping you to have a fertile plot come spring. Do you have fountains and drip irrigation systems? Now is the time to drain all the water from these, as well as your water hoses. This will prevent them from becoming damaged over the winter, saving you money and a headache come spring. Lawn aeration breaks up the soil and keeps water from pooling. Most importantly, the process ensures that nutrients, oxygen, water, and fertilizer reach the roots. There are a few methods for lawn aeration, and if you need assistance with this task, be sure to contact your local lawn care company. Hand in hand with aeration, fall lawn fertilization is the perfect way to send your yard into winter with the nutrients it needs to survive the long and cold slumber. Providing your lawn with a dash of nutrients will help protect the roots over winter and give them the foundation they need to bounce back once spring arrives. What fall to-do list would be complete without raking? Don’t let fallen leaves suffocate and damage your lawn. 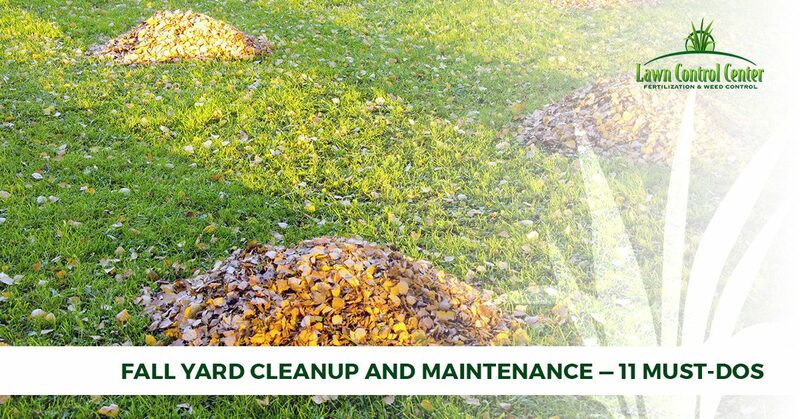 Stay on top of the fallen leaves by raking them up regularly. Additionally, for an added bonus, shred them up and use them as mulch for young trees, shrubs, and flower beds. If you have blooming perennials like clematis or roses, the fall is the perfect time to prune and train the branches. Also, now is a great time to cut back dead branches and overgrown trees. Remember that snow can pile up on trees, causing weak branches to breakaway. If you spot a potentially problematic branch, be sure to trim it back. If your perennials really took off this year, now is the time to divide them and spread the joy. By dividing them and adding them to other beds around your yard, this will save you time and money come spring. Winter is coming. Don’t let your sensitive perennials stay north of the wall during the cold season — and by this we mean, add mulch to the base and wrap sensitive plants in cloth barriers to keep them from being damaged by freezing temperatures. Some bulbs, shrubs, and annuals do best when planted in the fall. If you have fall pansies or hyacinth bulbs, for example, now is the time to get them in the ground. Not only do these plants thrive when planted in the fall, but they also can be a great addition to your yard, adding a burst of color while other plants are snoozing. Decks, patios, and other outdoor spaces are quite durable. However, to keep them in optimal condition, it is crucial to give them a good thorough clean from time to time. The fall is the perfect time to perform this task. Help prevent the growth of mold and mildew by giving your deck or patio a good power wash. Depending on the type of deck or patio you have, it may be beneficial to also add a weatherproofing stain to protect the wood from damage over the winter. Need help with your fall lawn care? We’re ready to help! Learn more about our lawn care services and contact us today to get your free quote.